Los Altos gets defensive in 21-7 win: Anyone thinking that the Los Altos High School football is a one-man show got a rude awakening on Friday night. With star running back Tyler Nevens bottled up for most of the night, the Conquerors turned to other methods to post a 21-7 win over host Charter Oak and clinch at least a share of the Hacienda League championship. Nogales closing in on league title: Nogales overcame an early 14-point deficit to score 28 unanswered points on its way to beating Duarte in a pivotal Montview League game, 28-14. Glendora comes up short: Ayala tackled Glendora quarterback Bryce Wooldridge at the 2-yard line as time expired to win its first league championship since 2008 by a score of 26-21 Friday night at Ayala.For a defense that had only given up six points in league, it was only fitting that it was the unit on the field to secure the Palomares League title in head coach A.J. Garcia’s first season at the helm. Damien hangs tough in loss: The Damien Spartans were able to do something few teams have done this season — stay close to the explosive Rancho Cucamonga Cougars. Bishop Amat boots home OT win: Extra-point tries are usually one of the more mundane parts of a football game but the last extra point of the night for the Bishop Amat High School football team was the biggest of the team’s season. Kicker Shazel Sakr nailed the ball through the uprights to give the Lancers a thrilling 41-40 overtime win over Chaminade in Mission League action on Friday night. Rancho Cucamonga 44, Damien 24 — Great result despite loss against one of the best teams in SoCal. 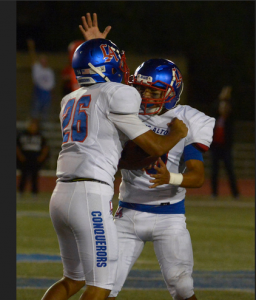 Los Altos 21, Charter Oak 7 — At the end of the night, chalk this up to a ferocious Conquerors defense. West Covina 28, Chino 12 — Bulldogs can share league title with a win over Los Altos in finale. Diamond Ranch 35, Walnut 7 — Sadly, only automatic W in Hacienda is against Walnut. Garey 35, Ganesha 0 — Thought Giants would put up more fight than this. Bishop Amat 41, Chaminade 40, OT — Went 7-3 and should have gone 8-2 and beat Loyola. Regardless, they proved a lot of doubters wrong, including me. El Monte 30, Rosemead 27, OT — The battle for third best in the MVL goes to the Lions. Mountain View 40, Gabrielino 0 — Final score is surprising, thought Eagles would be better. South El Monte 28, Marshall 8 — Only blemish is the Arroyo loss. Nogales 28, Duarte 14 — Massive win for the Nobles, who go to first thanks to Sierra Vista’s win over Azusa. Workman 28, Gladstone 6 — Lobos much improved. Sierra Vista 20, Azusa 19 — Aztecs got win it needed from Nogales, then fell to Sierra Vista. Claremont 55, Diamond Bar 41 — Lot of offense for two teams going nowhere. Ayala 26, Glendora 21 — Tartans had chance in final minute, couldn’t pull it out. South Hills 49, Bonita 17 — Huskies could be a real threat in Division 7 if it gets in. Northview 62, Wilson 0 — About what you expected. Balddin Park 28, San Dimas 23 — The absolute shocker of the season, give Baldwin Park all the props. Who saw it coming? Nobody. If San Dimas beats Covina and Northview beats Baldwin Park then San Dimas and Covina will both be 3-2. They would get the #2 entry into the playoffs since they beat Covina. This night belonged to BOTH a ferocious LA defense and the devastating punts of Hunter White. At least 5 punts pinning CO inside their own 10 with 4 of those punts inside the 5. Nu runbacks allowed on kick offs either. All league punter, or there is no all league punter. LA could possibly win out and may not meet a team superior than CO throughout the play offs. But I sense there could be so much more from this LA offense. Every week the headlines are the same, opponents know what’s coming, but stopping it is another story. Well tonight CO did pretty much that. I counted a single play action play, which resulted in a long touchdown pass to what looked like a very capable tight end. Not a single swing pass, no screens, no effort to get Nevens into space. Just a steady diet of Tyler between the tackles. Can’t argue with winning, but after a quick 14 point lead, including an interception for a TD, CO was free to put 8 and 9 in the box and take shots at Nevens. The kid is tough as nails, but why not try and get him into space? If for nothing else, just to give a defensive coordinator something else to think about? Good win, great defensive play, exquisite kicking game! I saw two screen passes on 3rd and long that Cody missed on both. I think the coaches quit too early on the short passing game. You have to keep passing the ball to give Nevens room up front. The pass helps your running game and the run helps the passing game. LA needs to stay with the pass [short] longer than they did. Coaches need to stop the consistent play calling of Nevens up the middle twice then throw on 3rd and long. Wow, how bout that defense and you are right Hunter White has been special all season long. I’ve seen LA teams since the early seventies, and have never seen a bigger set of linemen. Demographics; remember Mario Gomez, Mario Morales and even Coach James Hernandez were all pretty big boys in the ’80s. These damn kids keep getting bigger and bigger! Love them Lancers. Keep proving everyone wrong week after week. Now we should be hosting the first round of Div 1 playoffs. Nothing but heart with this team. Go big blue! Amat s/b be able to handle their 1st round opponent at home OR on the road. I’d prefer the 2nd round game at Kiefer. I agree . They actually have been good away this year . All losses where at home . If the season ended today, how would the D1 playoffs look match up wise 1st round games? Note: Amat is NOT Mission League Champ, Serra is. My mistake on Amat, 1st team that came to mind from the Mission. SJB will not be #4 seed. That would put them on the same side of bracket with MD and CIF will not do that. IMO, MD #1, CC #2, SJB #3 and MV #4. CIF always guarantees the top four seeds, regardless of league affiliation. They just tend to adjust the seeds to respect seeded teams that are in the same league by placing them on opposite sides of the bracket. That’s the problem with being an all world team and coach for seven games, you play 10. Saints going out like a bean burrito fart. Stinky with a lingering effect. Congratulations to Bishop Amat for its signature victory of the season. I’m still not a fan of “Pooch” kick offs, Chaminade ran one back for a touchdown and, once again, killed Amat’s momentum and gave it to the Eagles. I’m liking Christopher Lopez more and more. He hits the line awfully quick. The running back position is looking good for the future. Agree on the Pooch kick offs….dumb, dumb, dumb. When Amat’s kicker kicked them deep, the gunners and rest of the ko team were able to get down the field and stop Chaminade at the 20. Kick them DEEP, it’s THAT simple. Well we dodged another bullet from our own gun to get the W Friday night . How in the heck can the staff keep taking ( Loyola ) or trying to take victories away from the team . Friday nights kicking game was horrendous to say the least . Why spot good teams 15-25 extra yards when it is totally unneeded . On the long kick offs the LANCERS were covering fine , keeping Chaminade in check and no long runs were had . AMAT up by 14 with 8-9 minutes in the game and we pooch kick ????????????????? What could have possibly been going thru Hags mind to call that play . Greed , catch them off guard , what ????????? Please for the playoffs leave the tricks in the locker room , we are a good enough team to play heads up hard nose football . NO GIMICKS NEEDED !!!!!!!! Great job by the LANCERS on getting the win and coach Hags should go out and buy you guys all brand new cars , as you saved his neck Friday night big time !!!! GO AMAT !!!!!! On to the playoffs !!!!!! There is complete game footage on YouTube of game . Just search Chaminade football 2016 bishop Amat .